Fact: Women love boats. 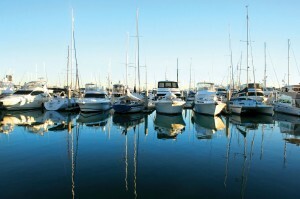 We love riding in boats, looking at boats, yacht clubs, booze cruises. You name it, we’re on board with it (literally). And since July is the prime season for sailing into her heart and dropping anchor, Miss Wingman thought it only fair to provide you with a little nautical footwear rundown. Why? Because you should capitalize on this opportunity to put your best foot forward while it’s still seasonally appropriate. And because the only thing that can hurt your chances is what you’ve got on your feet. So take a break from swabbing the deck, raise the sails and listen up, boys. (*Miss Wingman note: In Googling whether “swabbing the deck” is even a viable nautical term anymore, I discovered that it has an alternate meaning of the perverse sexual variety. Thanks for the traumatic new knowledge, Urban Dictionary). You’ve heard me rant against public enemy #1, Crocs, before. And decry the offensiveness of mandals (that’s “man sandals” for the uninitiated). And I’ve grazed over the merits of Sperry’s and flip flops (both completely fine). But a new potential enemy has surfaced in my war against male footwear, and I had to share it with you. Am I the only one who hadn’t heard of these before? It’s recently come to my attention that someone has taken the idea of summery dude shoes to another level, and thus Swims were unleashed on the world. They’re a hybrid of aqua socks (bleh!) 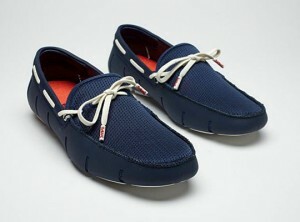 and loafers, and they look a little like a Tod’s driving moccasin with an entirely mesh, waterproof cloth body. Oh, and they come with laces and tassles, too… if that’s what you’re into. As ridiculous as this sounds, I’ve been grappling with what my opinion is on these things since they were put onto my radar. 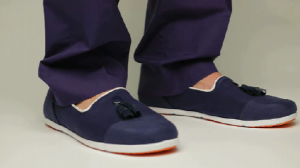 So I did a little research: The Norwegian company who created Swims (or more accurately, a Norwegian guy named Johan), began by making fashion-questionable galoshes to help protect shoes during the soaking rainy season. Yes, galoshes – those things your dad wore. Or your mom, they make a truly horrifying version for women’s high heels, too (Thanks a lot, Norway). This is a fine idea I suppose, but somehow over time they expanded the brand and began cross-pollinating water proof shoes with penny loafers, and this is where the trouble started. Though I understand the necessity for a rubber-soled shoe for men, I think I’ve finally figured out where I stand on the issue: The world did not need the Swims loafer. It has simply gone too far. That said, I know there will be several of you who will adamantly defend these ridiculous things – just like legions of Croakies lovers came out of the woodwork after I bashed those, too. Miss Wingman is still getting photos of Croakies texted to me and email testimonials from friends who apparently love those God awful things. (PS, remind me to de-friend all of you now, thanks). So, if you choose to ignore my purchase advice and absolutely MUST take a dip in the Swims pool, there are only a few acceptable styles and colors to choose from among the vast array they offer. I’m more pro-tassle than pro-flat front loafer, which is considerably less attractive. The lace up loafer is the least heinous style and the penny loafer is borderline, in my opinion. As for colors? Navy is nice, gray is good, and the orange, red or green? Those would even be a little bit much if you were competing in a regatta. Yikes. Under no circumstances should males rock the white Swims – in any style. You’ve heard me say this before, but no one can pull those off. Not even a deckhand on the Love Boat. I mean it – cut that sh*t out. You’d also do well to avoid the Charles style, but the forthcoming Helmut isn’t too terrible, from what I can tell. But if I ever spot any of you sporting the slipper Swims, I’m staging an intervention, and it won’t be pretty. In fairness, I would never give you a full list of “Don’ts” without at least offering you some alternatives. That said, I’ve grown to appreciate a good Sperry top-sider. Recent collaborations that I love are the Sperry Top-Sider/Band of Outsiders styles and Sperry for Barneys Co-Op (a pop of color at it’s very best). I also never find fault with flip flops, unless they’re of the Adidas, shower shoe variety – it’s not college anymore – and Cons (ahem, Converse) will always be an old school favorite of mine. But whatever direction your footwear fetish takes you, keep in mind two things: 1) Gay men can pull off many things that straight guys cannot (look no further than length of shorts hem). Baby steps, boys, don’t try to emulate – for your own good. And 2) Remember, even if you don’t actually have a boat, that doesn’t mean you can’t use them to your girl-getting advantage. Good luck, god speed, and may the romance waters always be smooth sailing. This entry was posted in DAPPER WINGMAN and tagged Croakies, Dapper Wingman, dating advice, I'm On A Boat: A Rundown of Acceptable Summer Footwear, men's style advice, Miss Wingman, relationship advice, Sperry Top-Sider, style do's and don'ts, summer shoes for guys, Swims shoes, what women think, wingman, wingwoman by renata. Bookmark the permalink. Easy on the Norwegians! He must be half Italian! Really? Have you ever even tried on Swims? You obviously have never seen anyone walking around in them because you state that you’d never heard of them before and they’ve just recently popped up on your radar. Anyway, my friends and I love Swims – and I only first saw them a few months back being worn by the pool staff of the Cosmopolitan Hotel in Vegas.